Why There Are Words Literary Reading Series Showcases Chicago Writers. Why There Are Words Literary Reading Series takes place monthly in the San Francisco Bay Area, providing an important way for writers to reach audiences. Writers are established and emerging authors selected via submissions. Readings are not tied to book releases (and thus, not marketing decisions); the series operates on the premise that good writing always needs to be heard. This event will feature four Chicago authors reading fiction. We’re proud to have been selected to take part in the conference. Join us! Catherine Brady was born and raised in the Chicago area and graduated from Northwestern University. 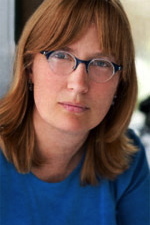 She is the author of three short story collections, including Curled in the Bed of Love, winner of the 2002 Flannery O’Connor Award for Short Fiction, and The Mechanics of Falling, winner of the 2010 Northern California Book Award for Fiction. Her stories have appeared in numerous literary journals and anthologies, including Best American Short Stories. Her craft book Story Logic and the Craft of Fiction has just been published by Palgrave Macmillan, and she’s also the author of a biography of a Nobel laureate, Elizabeth Blackburn and the Story of Telomeres: Deciphering the Ends of DNA. She is the academic director of the MFA in Writing Program at the University of San Francisco and is currently at work on a novel. Goldie Goldbloom grew up in Western Australia but has lived in Chicago for the past eighteen years and likes it very much indeed. Her novel, The Paperbark Shoe, won a bunch of awards, she is still wondering why, and she has also published a collection of short stories, You Lose These. Her short fiction has appeared in StoryQuarterly, Narrative Magazine and Prairie Schooners. In her spare time, Goldie teaches creative writing at Northwestern University, is a mentor for transgender youth, and an activist for the Orthodox Jewish Queer community. Her main job is raising her eight children and trying to find pairs of socks in the massive pile on her laundry counter. Billy Lombardo is the author, most recently, of How to Hold a Woman and The Man with Two Arms. He is the 2011 winner of the Nelson Algren Award for short fiction. He is the co-founder and managing editor of Polyphony H.S., an international literary magazine for high school writers and editors. He teaches at The Latin School of Chicago. Peter Orner was born in Chicago. His books include Esther Stories (Winner of the Rome Prize), The Second Coming of Mavala Shikongo (Winner of the Bard Fiction Prize and Finalist for the Los Angeles Times Book award), and the recently published novel, Love and Shame and Love. Adam Langer wrote in the Chicago Tribune that Love and Shame and Love “is an ambitious, kaleidoscopic novel of the Jewish experience in Chicago…and serves not only as an ode to the history of Chicago, but to Chicago literature itself.” Orner’s work has appeared in the Paris Review, The Atlantic, Best American Stories, and has twice won a Pushcart Prize. He currently lives in San Francisco.